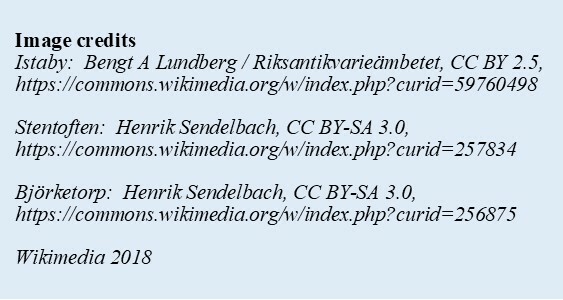 Of all the places in Sweden that have Runestones, why should I choose Blekinge, in the southeastern part of the country on the Baltic sea? I mean it has only three Runestones of the roughly 2,000 that are in Sweden. However, these three share a few similarities. The are all dated to between the years 500-790; they were all carved in a Proto-Norse version of Runes, which were used during the transition from the Elder to Younger Futhark; and, they are linked to the same tribe. I believe they are all also designated to the same clan. Blekinge used to have four Runestones, but one - the Gummarp Runestone - was destroyed in the 1728 Copenhagen Fire that burned almost half of the older section of the city. The interpretation of these Runes comes down to two options - Haþuwulfar carves them for himself or they were carved in his memory. Either way, three staves were carved for him - fff. Haþuwulfar also appears on the Istaby Runestone. Here, Haþuwulfar refers to himself as Heruwulfar's son and he is paying tribute in memory of Hariwulfar. The names are what make this Runstone so interesting. As you may have surmised, 'wulf' means 'wolf'. 'Hari' and 'Haþu' mean 'warrior' and 'battle' respectively. The warrior wolf and battle wolf are part of a larger clan that may have incorporated wolves or the idea that wolves are a pack or family into rituals and religious ceremonies to initiate young warriors into the fold. To see this Runestone, you need to visit Stockholm as it resides in the Swedish Museum of National Antiquities. 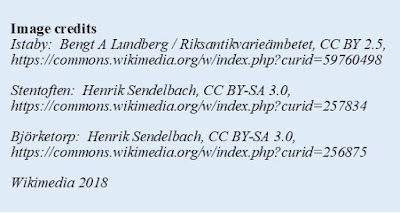 The Third Runestone is where things start to get really interesting, because this is where the curses come in. Lying face down, surrounded by five other stones that formed a pentagon, the Stentoften Runestone was discovered in 1823. In 1864, it was moved to the church of Sölvesborg. The carving on this stone talks about how dwellers and guests [of] Haþuwulfar had a bountiful harvest. In part, this carving uses the Younger Futhark version of Jera to represent the harvest. 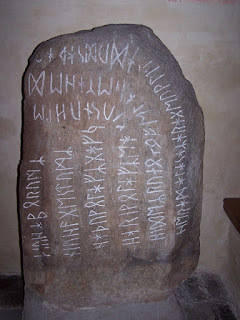 There are other Runes on this stone, like Kenaz, that are in the transitional form from the Elder to Younger Futhark. An animal sacrifice occurred either to help with the good bounty or to give thanks for it. This part is unclear. You should also be warned that, "I, master of the runes(?) conceal here, runes of power, incessantly (plagued by) maleficence, (doomed to) insidious death (is) he who this breaks." So, I highly advise that you don't break it. 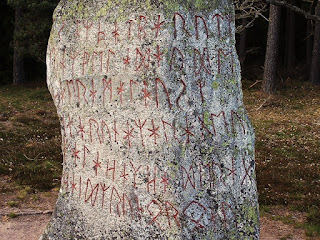 The only one of Blekinge's Runestones that still resides in its original location is the Björketorp Runestone, located east of Ronneby off of E22. 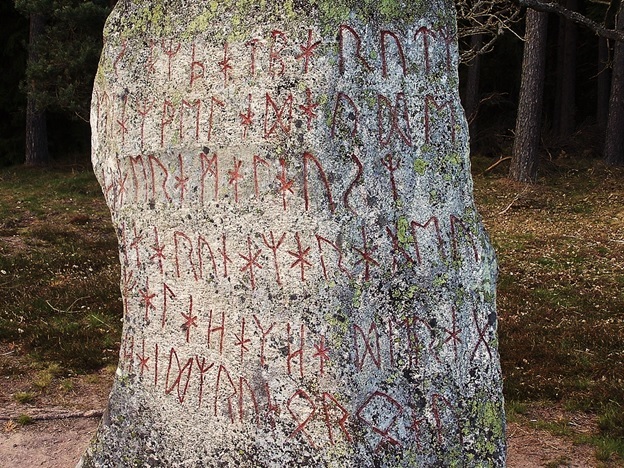 One of the tallest Runestones in the world, it forms a circle with two other large stones called menhirs, because nothing is carved on them. One of the lines on the stone matches almost exactly, in words, the line from Stentoften. However, scholars say that the two stones were not carved by the same runemaster. It says, "I, master of the runes(?) conceal here runes of power. Incessantly (plagued by) maleficence, (doomed to) insidious death (is) he who breaks this (monument)." This stone, however, goes one step further, including a prophesy of destruction. Scholars have put forth a host of potential meanings for these stones. The one I like is the notion that these Runestones marked a border between different clans, possibly Swedes and Danes.